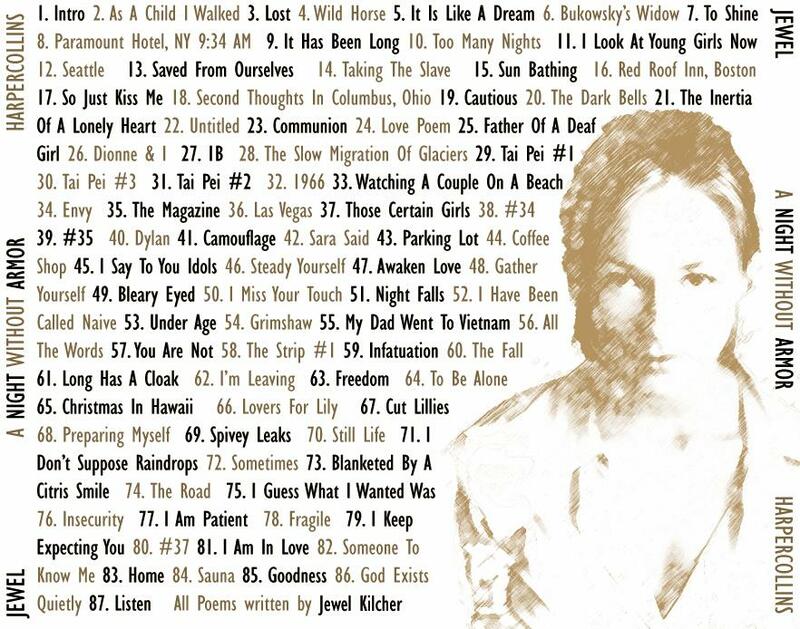 For the upcoming audio release of Jewel's new book, Harper-Collins was unable to include this finalized tracklisting on the graphics on the first (and probably most copies to be sold) pressing of the" A Night Without Armour" CD. This will be corrected on future pressings, but for now, or instead of buying it twice, you may want to print this out as a way to identify this CD with 87 tracks. The tracks are not in the same order as the book & not all of the poems in the book are included so a tracklist may be very helpful. Special thanks to Mr. BB for this early list. This is a color graphic that was designed to be printed for the back, under tray insert. Originally designed for color laser printing, so it is high resolution, 150 dpi, 882x694x16.7 million colors. Please download the full image and set your print settings accordingly for best results. Jewel has included a portion of her poetry in Pieces Of You, Save The Linoleum and You Were Meant For Me.